One of the most common conditions seen in a medical office is shoulder pain. In my own chiropractic practice, more patients arrive in my office with with concerns about shoulder pain than low back pain. In fact, nearly every person I treat says, “I carry my stress in my shoulders”. This stress or shoulder and neck pain typically presents as: pain in the upper shoulders, called trapezius muscles, pain in the shoulder or deltoid muscle, and pain in the shoulder blade. And, nearly every time I see a patient present with this pain, the patient thinks they have a rotator cuff issue. More often than not, however; this is not the case. They are actually suffering from a neck condition. While rotator cuff injuries do exhibit similar pain patterns, rotator cuff issues typically result from an injury or from over use. Also, the rotator cuff is a muscle and should heal on its own, after a few weeks, if it is a simple strain. The vast majority of shoulder pain I see is chronic, seems to come out of nowhere, and has been getting worse for months or years. This is a classic example of a neck issue referring pain into the shoulder, a condition called cervical radiculopathy. This condition typically results from an old injury such as a rear end collision or old sports injuries. Shoulder blade pain that is actually referred pain from the neck presents in a very classic pattern. The patient will say they have a pain just along one of the shoulder blades. This pain will be stabbing, throbbing, intense and hurts regardless of activity or rest. Most people think ‘it will just go away’, yet it has persisted for months or years. It will spread up into the neck and base of the skull and travel down the shoulder into the arm and eventually the hand and fingers. This pain can turn into nerve dysfunction such as numbness, tingling, burning and weakness. Many times it can also be mistaken as carpel tunnel syndrome. All shoulder conditions require evaluation of the neck, also known as the cervical spine, especially if the shoulder is not responding to conservative care such as physical therapy. Multiple times per day, a patient comes in our office with shoulder pain that is relieved following treatment of the cervical spine. The various types of treatment for the neck include: chiropractic adjustments, decompression therapy (stretching of the neck) and K-laser. 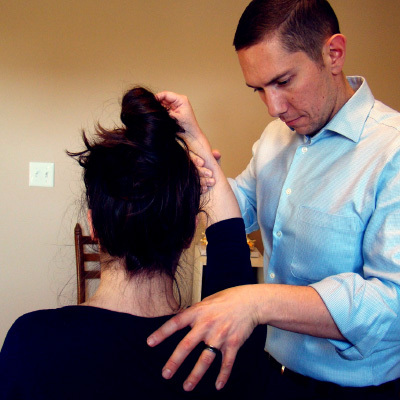 The chiropractic adjustment is done to restore proper motion in the joints of the neck. Decompression is done to gently pull the neck and relieve the pressure from a bulging or inflamed disc. K-laser is a form of light therapy that is designed to decrease inflammation and improve tissue regeneration. All of these therapies are designed to take pressure off the nerve and disc that is referring pain into the shoulder as well as decrease inflammation to the surrounding tissues. This type of care is called conservative care as it does not include drugs, injections or surgery. Conservative care should always be the first step in relieving physical conditions like pain, decreased mobility, and inflammation. If these symptoms sound similar to you or you have a shoulder issue that is not responding to other kinds of care, call and make an appointment to have your neck evaluated at Moving Toward Balance. Through conservative care, perhaps we can begin your journey toward relieving long-standing issues with pain, discomfort, and mobility.